The last MG branded car to be built in the UK has already rolled off the production line. After 90 years of production the Chinese owners of the MG marque have decided to more production… yes, you guessed it – to China. Shanghai-based SAIC Motor acquired Chinese automaker Nanjing Automobile in 2006 following their purchase of the MG marque and the Longbridge facility (for £53 million) just 12 month earlier. The British-badged carmaker, first established in 1920, sold 2,300 vehicles in the UK last year. However, SAIC suggest that the move will only cost 25 jobs in the UK. The low redundancy figure can be attributed to the fact that much of the actual manufacturing was off-shored soon after the initial 2006 deal. The production line in Longbridge, as I understand it, was mainly for screwing on the bumpers and other last fix assembly. 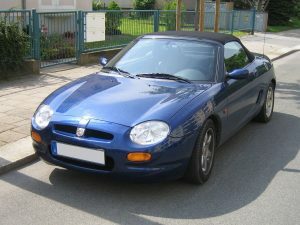 So, the reality is that, if you have bought a new MG in the last 10 years. Its claim to be ‘Made in Britain’ might be considered to be illegitimate. Ultimately, the latest news is the final nail in the coffin for the manufacture of these iconic British sports cars in the UK.